Connected Medical Center offers a wide range of physical therapy modalities. The majority of the patients we serve have issues which are best corrected by the combination of chiropractic manipulation and physical therapy modalities. Each case is different, but in general, physical therapy tends to begin as passive and conclude as active. In other words, patients can expect to progress towards more involved and physically active care as their overall health improves. Physical therapy is a broad term for the use of equipment to help patients recover from physical injuries. As a chiropractor (we are not physical therapist) one of the tools we choose to utilize in our practice is physiotherapy or modalities commonly referred to as physical therapy modalities. One of the most effective tools to help patients recover is the use of corrective exercises tailored to your individual needs to help build strength, endurance, coordination and flexibility. Depending on your injury or pain source, we will design a plan targeted to specifically help your body heal. Our office includes an on-site rehabilitation are where our team will work with work with you every step of the way. Rehabilitative exercises are designed to compliment other non-invasive care you may be receiving from our chiropractor. These exercises strengthen the body, speeding the process of healing while also protecting against future injury. 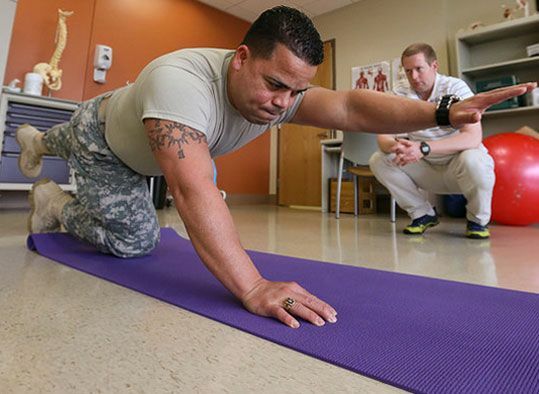 Stretching and strengthening exercises can help patients of all ages recover from injury and achieve optimal health. We recommend therapy for patients recovering from auto accidents and sports injuries, as well as patients suffering from chronic back and neck pain. Physical medicine modalities are another form of physical therapy. These modalities include muscle stimulation and ultrasound which are used to decrease pain and inflammation and speed the healing process. These modalities may be combined with other treatment options available at Connected Medical Center. We will decide the best combination of treatment for your specific condition and use everything at our disposal to relieve your pain the quickest.